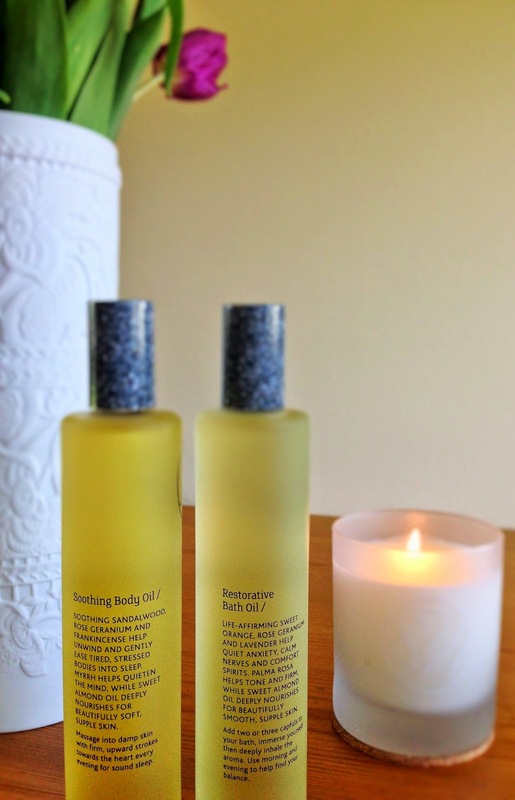 I have been using Espa's aromatherapy bath and body oils for years. In fact, their Soothing Body Oil is right up there with my favourite products of all time, so it only seems fair that I share the love! The first time I heard of this brand was when my Aunty - a dedicated visitor of spas across the globe - bought me the Soothing Body Oil for Christmas a few years ago. It just so happened that at the time I was having difficulty sleeping - something that unfortunately afflicts me from time to time - so I was intrigued when I took this elegant glass bottle from its packaging and read that it was designed to "soothe and destress body and mind" and "gently ease" my poor, stressed out old body into a restful sleep. On first glance, I had assumed that it was simply a moisturising body oil, but oh no. This baby does so much more. If I've had a couple of bad nights, a long hot bath followed by lashings of this lovely stuff almost always does the trick. Yes, it makes my skin feel silky, but by far the best thing about this product is its incredible fragrance. According to Espa, it's the sweet almond oil it contains that softens the skin, while a combination of sandalwood, rose geranium and frankincense relax the body and myrrh "helps quieten the mind". When I rub this beautiful blend of oils into my skin, not only can I feel it seeping into my pores to soften my tightened muscles, but as I breathe it in, I can also sense the constant whirring of thoughts in my brain gradually slowing down. The scent seems to linger for hours, which sounds like it might be overpowering, but I don't find this at all. In fact, I find it incredibly soothing, as though I've been wrapped in a comforting blanket of fragrance for the night. Now I'm not saying that it knocks me out without fail every time I'm too stressed to sleep. It's not a miracle in a bottle and of course there is still the occasional night when nothing seems to work. But it's such a pleasure to use that it always makes me feel better, and most of the time, it really does help me sleep. Bath and Body oils. All are lovely. 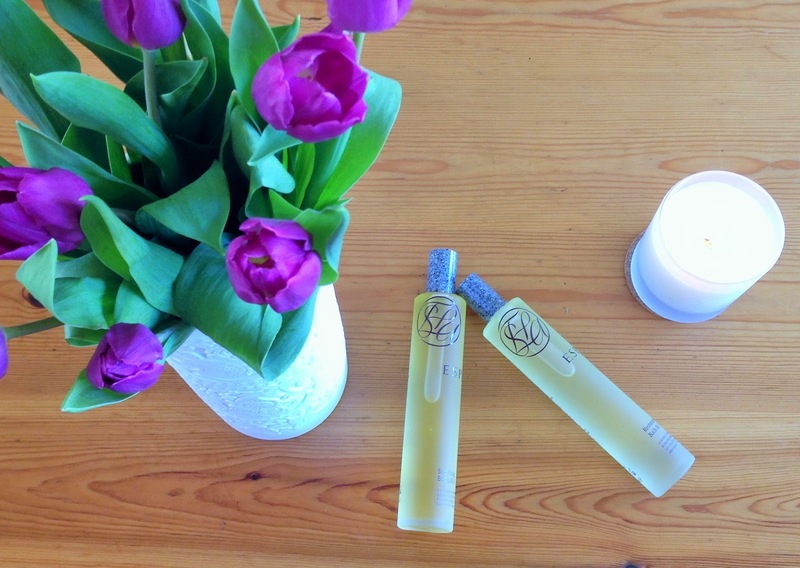 The restorative range is similar to the soothing one, also designed to calm, but with a different blend of oils intended lift the mood as well. It also claims to tone and firm the skin as well as soften it. I can't say that I have noticed this particular benefit, but then again, I haven't been using it on a daily basis. Perhaps I should! The bath oils smell amazing when you add them to your bath water and are lovely things to have, but if you were to only pick one product, I would recommend going for a body oil without hesitation. In my opinion, the body oils do an amazing job on their own, and not having the matching bath oil isn't going to take anything away from the overall effect. 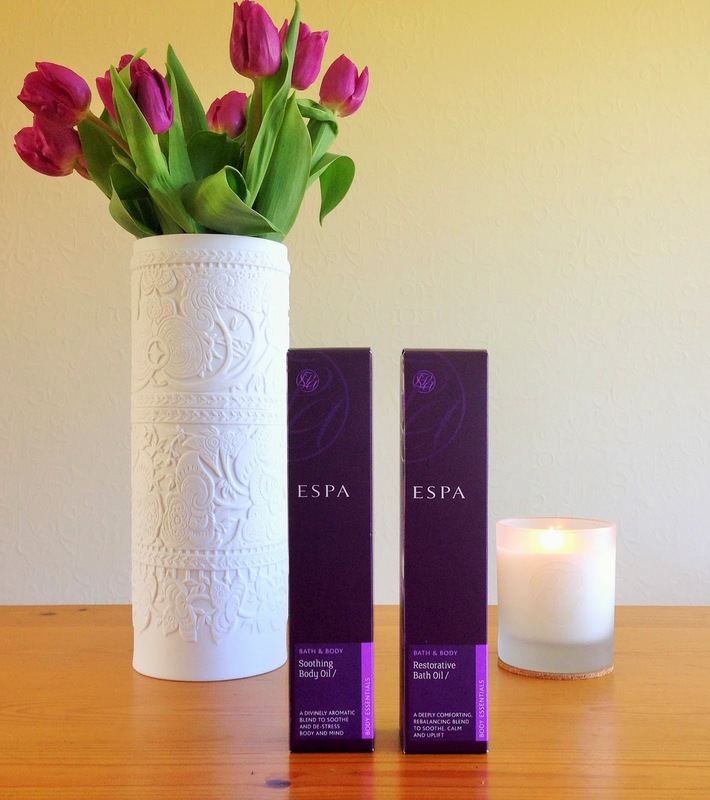 Incidentally, the candle in the pictures is also from Espa's soothing range, and smells very much like the oils. I like to light it when I have my bath. Again, you don't need it, but it's a nice thing to have. 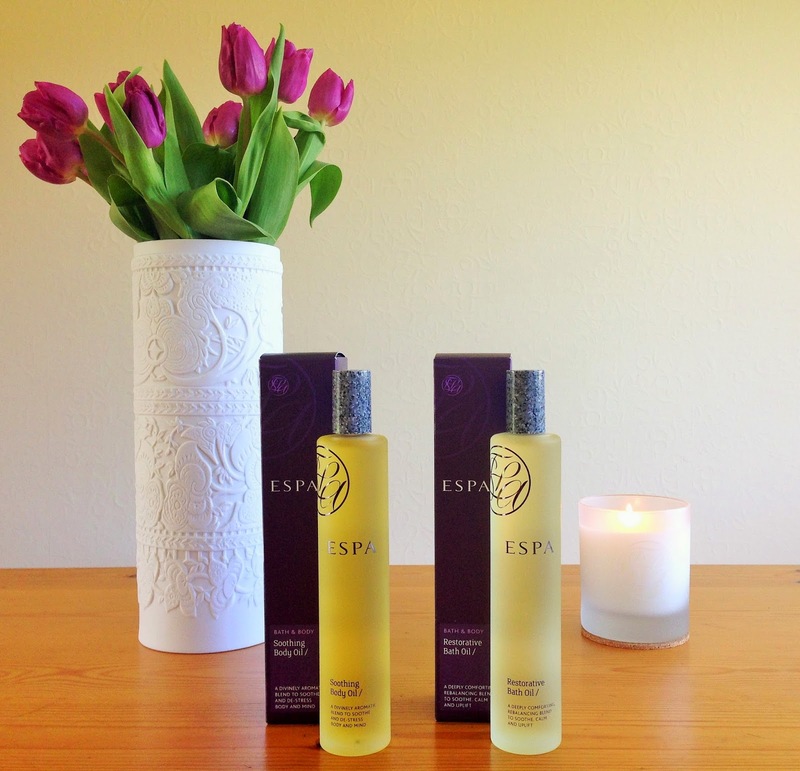 If you're looking for a body oil I really can't recommend Espa enough. The quality of the products I've tried is second to none. If, like me, you have trouble sleeping at times, the Soothing Body Oil could well become your new best friend, but there are quite a few other varieties including detoxifying, energising, and nourishing. Has anyone else tried any of these these products? 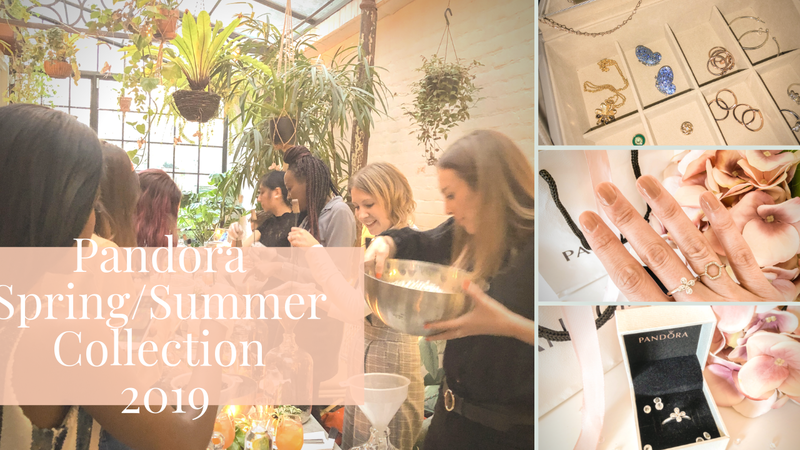 Or anything else from Espa? Every time I browse their site I see about 150 lotions and potions that I want to try, so I would love some recommendations! I've been wanting to try something to spray before I go to sleep. Bath & Body has a huge selection of different soothing lotions and sprays. I've never thought to try an oil! Ooh Decleor do a lovely lavender pillow spray. The effect doesn't last as long as Espa's body oils though. I'd never heard of these products before but you've really made me want to try them now! Not familiar with these but I want to know more! Seems to be so refreshing!! And those tulips look so fresh and pretty..